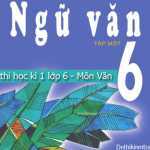 Đề thi và đáp án đề thi học kì 1 lớp 6 môn Tiếng Anh năm học 2015 – 2016 của trường THCS Hoa Lư. 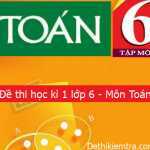 Thời gian làm bài 45 phút. 4. What ………..does Nga get up ? 6. How many…………………..are there in your family ? 7. I have …………………………….. then I go to school in the morning. 8. His father is a doctor. He works in a ………………..
12. Are they ________- their homework ? Nam is a student. He gets up at half past five. He (1)………………..a shower and gets dressed. He (2)………………his breakfast then leaves the (3)……………….at half past six. The school is (4)……………….his house so he walks. Classes start at seven and (5)………………at half past eleven. He walks (6)………………..and has luch at twelve o’clock. 1. Nam gets up at five thirty. 2. He goes to school by bike. 4. Your classes start at seven o’clock. 5. Your classes finish at ten to five. 1.I/ live/ a house / a lake. 2.There/ thirty five students/ my class. 1.When do you have English ? 2.What’s there, near your house ? 1.I live in a house near a lake. 2.There are thirty five students in my class.